Truly sustainable livestock farming requires the use of a pasture-based system. Pasture-raised animals roam freely in their natural environment where they are able to eat nutritious grasses and other plants that their bodies are designed to digest. In addition to dramatically improving the welfare of our farm animals, pasturing also helps reduce environmental damage and yields meat and eggs that are tastier and contain superiour nutrition. pasture, animals are able to move freely and carry out their natural behaviors. This lifestyle provides access to fresh air or sunlight eliminating the need for the use of antibiotics. Intended Way Farm uses farming and shepherding practices that take into consideration the unique God-given design of each animal. The beef cows graze on pasture and are given hay in the colder months. They are never given grain because the unique design of their digestive system does not provide for the digestion of grains. They are rotated in the pastures to provide a new patch of fresh grasses routinely. We are thankful for the fertilizer that they add daily to the soil! The chickens are happily out in the pastures during the day: pecking and scratching, eating bugs and larvae, and cleaning up the cow pies. Their beaks are intact and their wings are not clipped. Their diets are supplemented with an organic whole grain mixture. 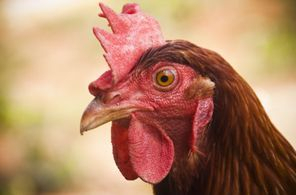 At night, they are safely secured in their mobile coop that is rotated to clean grass routinely -- their manure fertilizes the soil as they roam the pastures and as their droppings collect on the ground underneath their perches at night. We have chosen two heritage breed chickens to raise and reproduce-- the Ameraucana and Delaware. 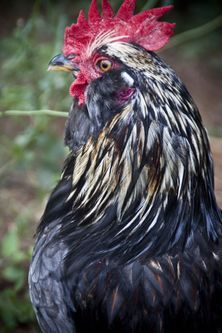 The Ameraucana are raised primarily for egg production and lay blue-green eggs. 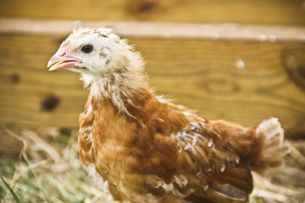 The Delaware are raised for both egg and meat production and lay a beautiful brown egg. Turkeys are also raised on Intended Way Farm. We raise a heritage breed turkey called the Bourbon Red that is cared for similarly to our chickens. They are out on pasture roaming, pecking, strutting, and gobbling. Their beaks and wings are intact and they are also supplemented with an organic whole grain mixture. They have the sweetest, most joyful chirp. 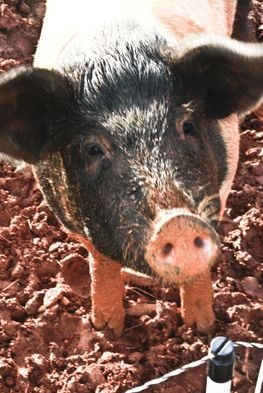 Our pigs also experience our rotating pastures and enjoy using their snouts to dig and rototil the soil. They are fed a mixed grain feed and they also enjoy the scraps from our kitchen. Because they are so easy to get attached to due to their endearing personalities, their names are Ham, Bacon, and Sausage to remind us of their purposes. Our meats and eggs are sold at our farm store on our farm at 513 Burge Road, Pinnacle, NC. Our hours of operation for the farm store are: Mon and Thurs 9 - 11 am, 2 - 4:30 pm. ** IF we need to make a last minute change to our farm store schedule, we will post this on Our Chosen Heritage FACE BOOK page. In addition, we distribute Reedy Fork Organic Feed-We can acquire the feed you desire, please contact us directly. We also distribute Amsoil/Agrand (Organic Fertilizers) Click the appropriate icon below to see the list of products.